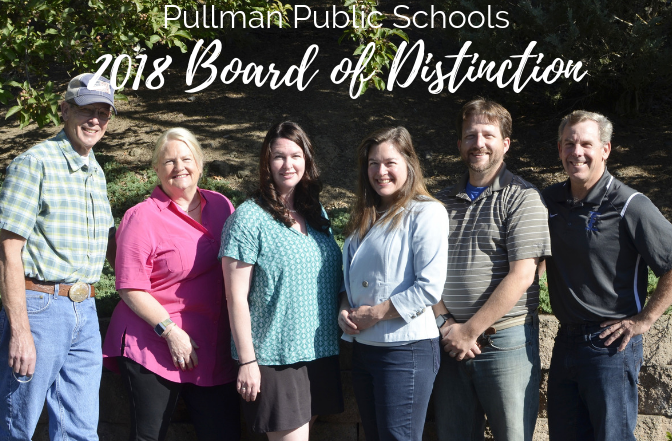 The Pullman School District Board of Directors is one of just 29 school boards in the state to receive the 2018 Board of Distinction award from the Washington State School Directors’ Association. This high honor recognizes exceptional collaborative leadership, oversight, and dedication to students and the community as well as exceptional levels of correlation between data, board decisions and positive outcomes for students. The Pullman School District board applied for the recognition earlier this fall, submitting extensive data and narrative essays showing the board’s effort to close the Opportunity Gap for our students and discussing how the board uses data to inform decisions. The board also shared evidence of good governance practices and effective leadership, as outlined in WSSDA standards for school boards. 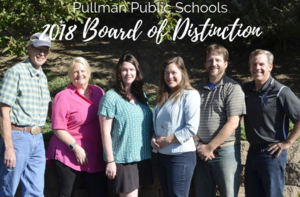 The Pullman School Board has been named a Board of Distinction 5 of the last 6 years.